FreeNAS® is an open source community, relying on the input and expertise of its users to help grow and improve FreeNAS®. When you take time to assist the community, your contributions benefit everyone who uses FreeNAS®. This section describes some areas of participation to get you started. It is by no means an exhaustive list. If you have an idea that you think would benefit the FreeNAS® community, bring it up on one of the resources mentioned in Support Resources. Not everyone speaks English, and having a complete translation of the user interface into native languages can make FreeNAS® much more useful to communities around the world. FreeNAS® uses Weblate to manage the translation of text shown in the FreeNAS® graphical administrative interface. Weblate provides an easy-to-use web-based editor and commenting system, making it possible for individuals to assist with translation or comment on existing translations. To see the status of translations, open https://weblate.trueos.org/projects/freenas/, as shown in Figure 27.1.1. Projects are a collection of text to be translated. In this example, the Django and DjangoJS projects have both been partially translated into Spanish. Click one of the entries under Project to help translate that project. Enter translations here, clicking Save to save the work. The controls at the top of the screen can be used to skip forward and back in the list of strings to be translated. Click Dashboard at the top of the screen to return to the Dashboard. 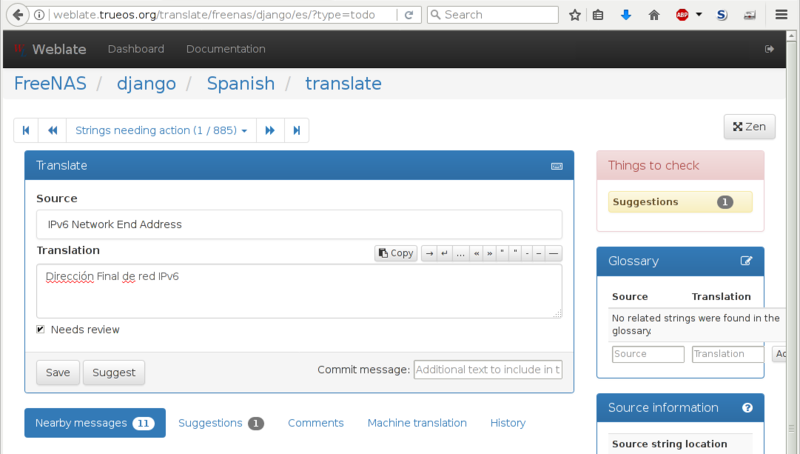 All assistance with translations helps to benefit the FreeNAS® community. Thank you!